I was thinking as I read it that it sounded very hunger games like! If we never hear from Sarkozy again we will know why. And I cracked up at shooting frogs. Here only hicks would do that! My students yesterday were laughing at me because I said I would miss Sarkozy and his charisma. They didn't feel that being charismatic was an important quality in a president. But then they did elect Ms. Merkel so..... there you go. Hopefully it wasn't really a Hunger Games situation because I do want to see Sarkozy and his eyebrows again! I'm going to miss Sarko too, and Carla of course. They had that certain je ne sais quoi... I wish Hollande luck as well, very trying times ahead to be sure. BBQ sounds awesome, you know how we Aussies love a BBQ. Not so big on the shooting frogs, although up in the north of Oz they often take to the Cane Toads with golf clubs. That makes us sound really classy, doesn't it? Yes, I'll miss Sarko and Carla too - bit of glamour. Very dramatic the way they do the telly thing. I always liked that expression 'faire le pont', we used to do that alot!! Wish we could the BBQ thing here but it's raining AGAIN! Moan, moan, moan. Enjoy! Wow, that's crazy that the communist guy got that much of the vote! I also love how you compared the election results to Hunger Games. Win! Ahhhhh BBQs. I miss them... That'll be one good thing about going home!! Oh the election...I've been brainwashed into thinking that France is going to become like Greece and everyone is going to kill themselves (according to Max's papa) so I hid the whole day in fear of the result ;) Now I realize that his dad is being ridiculous and we always have Canada. mmmm all I can think about is sausages and burgers and pimms mmmm I need BBQ asap! I had a feeling Hollande would win. American newspapers had a field day since the centre-left party is still called the Socialist Party instead of something like Labour or whanot. Funny to see right-wingers here go nuts about it. I wish Hollande all the best. Its easy to make big promises when one is campaigning but a lot harder to change things when you are the President especially when you have to get agreement with Germany. The U.S. Congress, years ago, ruined having any "bridge days", when they decided to reschedule most of our holidays on a Monday...aren't we efficient! I say, "Down with work, up with bar-b's!" Can you please write a book about your LPV life, please? Or make a movie! I want to come visit and just take it all in. It certainly will be interesting to see what comes of this change in party! When you say, "Shooting at Frogs", you're not being derogatory to the French, are you? Fred was totally glued to his Iphone for the election results. And with one minute to go, his phone died! I thought he was about to drop too. Sounds so much more dramatic than our drawn out elections over here! I love May in France! Last year was great because you didn't have to faire le pont (asking for the Monday off sometimes isn't easy) and had automatic three day weekends for the whole month of May. What should be interesting is next year when the holidays will fall on Wednesday, let's see if we can push the bridge for a five day weekend! Oh and us in the Marais got 61% for Hollande! Not surprised! Such an interesting post and I've always loved the 'faire le pont' expression. I wonder when the rain will stop here in the UK so that we might enjoy a little barbecue too - soon I hope! Shooting at frogs....lots of giggles here on reading that. 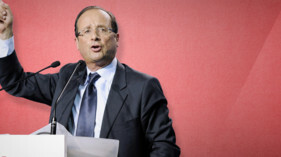 We're finally moving to Charente next Wednesday....should we be frightened of Hollande? I doubt it....I think, in spite of his rhetoric, he'll have to tow the line that Merkozy has set. But, feicead muid. Looking forward to faire le pont in our future! Bbqs sound like loads of fun!! Super jealous there ;) But, communist? Oh wow...you shocked me with that statistic!! How much fun! I love hearing about elections in other countries. It's interesting to see everyone's different takes on democracy. So many BBQ's--so much fun! Never knew the French adored them so.... Bonne chance à Monsieur Hollande--I know it makes a lot of people nervous, but sometimes change can be a good thing. What do you think will happen with Sarkozy and Carla Bruni? I really must start watching French TV! And the faire le pont? Well, we are going to faire le pont this week for the first time. Because last time? My husband didn't know about it (why doesn't anyone fill the Americans in?) and was one of the only people at work on the Monday before the Tuesday holiday.